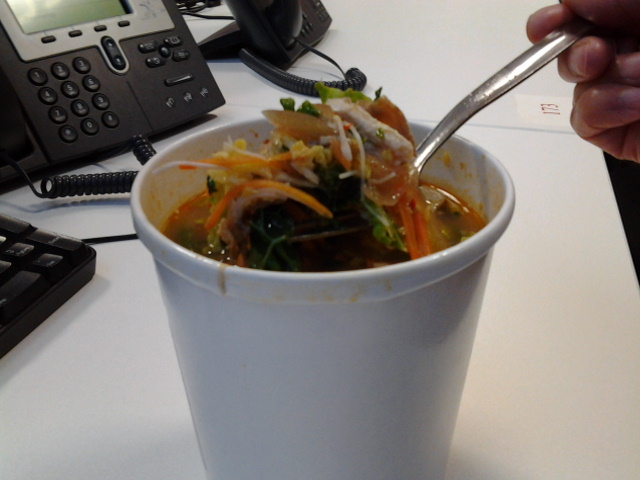 The healthy trend continues today at Junk4lunch but I promise my gluttonious self will return soon. As the weather turns colder, keep finding myself craving for soupy noodles. 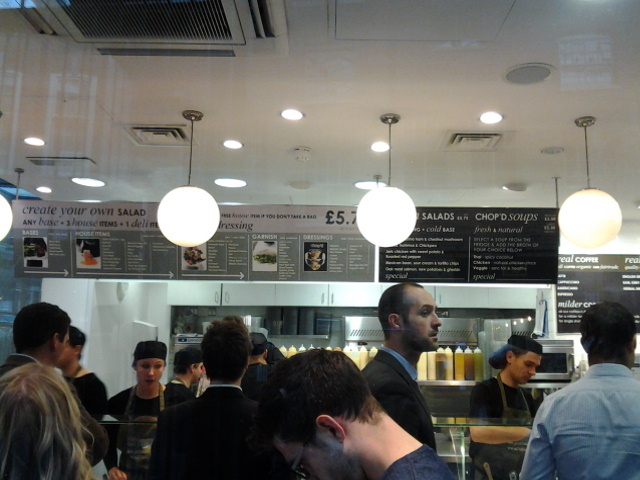 I have tried most of the soupy stuff from the independent as well as chain stalls around the area with one exception. So thought why not? 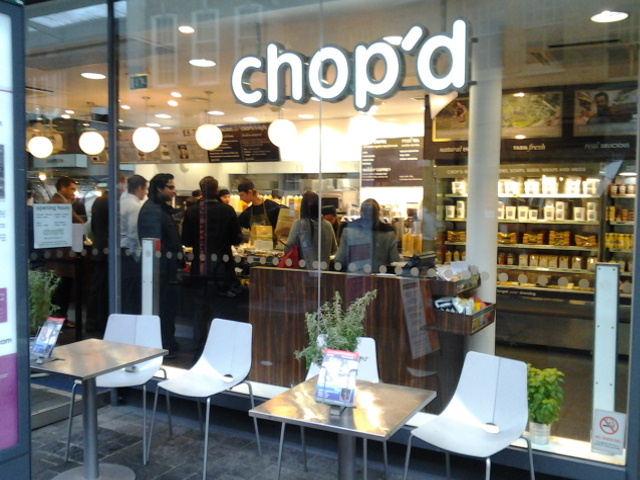 Chop’d is one of those what I would call DIY salad places that have sprung up in recent years. The idea is simple, they categorized the salad ingredients into groups, then you get to pick a number of items from each group to create your own salad for a fix price. You may add more from each group at an additional cost obviously. I find the concept pretty fun but for those of you who are undecisive, it can be a nightmare trying to figure out what goes with what with the queue forming behind you. To solve this problem, Chop’d also have pre-made salads ready to go. Most of these are tried and tested combination so they can’t go wrong. Apart from salads, Chop’d also has a variety of hot stews, noodle soup, wraps and sweet treats. 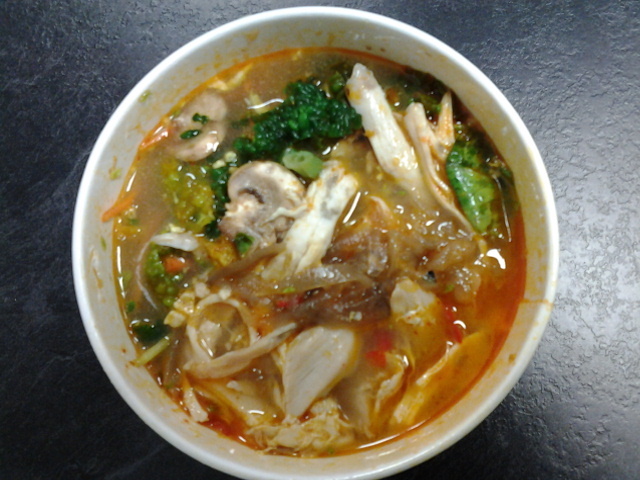 To satiate my craving, I grabbed the Chicken Noodle Supersoup tub from the fridge section and got it topped up with Thai Spicy broth. Other broth options include a vegetable and a chicken broth. 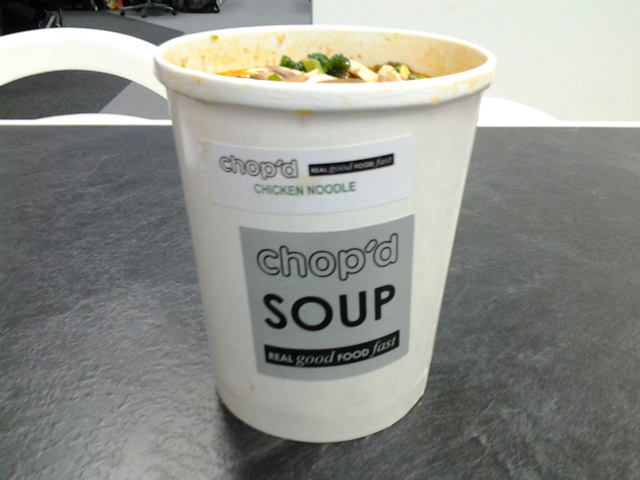 The soup tubs come in 2 sizes, the small at £3.50 and the large is £5.50. With the large soup coming in at only 271 kcal, perhaps I can have some toast and Marmite later! I was surprised, that I was only given a spoon and suspect the noodles will be all cut up thus you’d only need a spoon. I was right (as usual) also, the proportion of noodle to other ingredient is surprisingly low. I think the thin rice noodles only took up 10% of the entire tub. No wonder they can keep the calories down. Apart from the rice noodles, the other ingredients are shredded roast chicken, brocoli, savoy cabbage, carrot, mushrooms, green beans, lemongrass, edamame and some onion confit (sliced onions that has been sweat down). Did I enjoy it? Well, the broth was light and strongly fragrant with lemongrass but could with more salt. All the crunchy veggies were a joy to chew, realised I did not really missed the noodles while the shredded chicken was moist and tender. I enjoyed it but somehow, it did not hit my taste buds the way Crussh did yesterday. Perhaps I’m really hungry today, I think this is best suited for a hangover day.